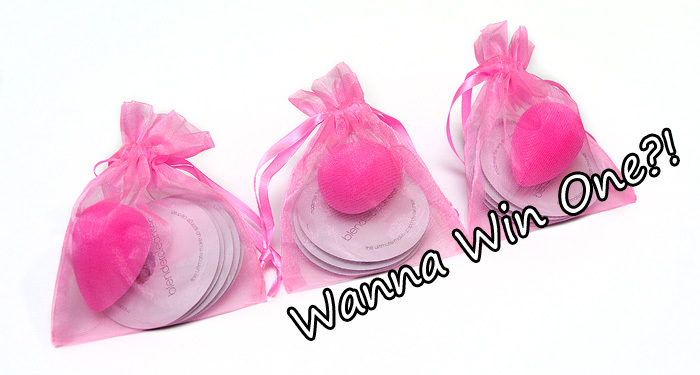 …I’ve got 3 brand spankin’ new Beauty Blenders to give away to you brilliant lot! Don’t know what a Beauty Blender is or why you’d need one? Check out my review here for more info. Enough of all that… wanna know how to win one? Q. Which newspaper rated the Beauty Blender as number 10 on their Top 50 Beauty Buys of 2008? Entered I hope I win! I need one of these! Wow! Wish me luck — these babies don’t sell here! Oh they look very kool!!! I’ve entered, and is keeping my fingers crossed now, I’d love to try one of them out!!! Oooh yay! 😀 good luck to everyone. Entered Fingers crossed I would love to test this out as a MUA ive heard so many great things about it. I’ve entered, thanks for a great give-away. I’ve always wanted to try the beautyblender. I have pretty good luck with my Laura Mercier makeup sponges, which I think are really good quality, but I hear so many raves for the beautyblender that I’ve been wanting to try it for a while now! This is exciting, thanks so much for the chance to win this! Have entered & have my fingers crossed. I am a HUGE fan of Beauty Blenders and stock them in my kit to use them on my clients when doing makeup jobs. They are not cheap but they are a must-have applicator. i have wanted this since the moment i found out about its existence! i pine over it every time i run into it at my duane reade…. sigh, this would be perfection to have! thanks for this giveaway!